(Bloomberg) -- Billionaire Ray Dalio called out the Federal Reserve in Davos on Tuesday, echoing a sentiment that’s firing up some big managers to load up on duration. Axa Investment Managers and JPMorgan Asset Management Inc. are among investors piling into long-dated bonds, confident that slowing growth will cause policy makers in the U.S. and Europe to moderate their resolve for monetary tightening this year. As global anxiety mounts, the Bridgewater Associates LP founder’s suggestion that the Fed’s desire to raise borrowing costs is “inappropriate” struck a chord with those who believe an increasingly dim outlook is clouding central banks’ paths. “If the trade discussions don’t go well then very clearly you want to be in duration and that’s going to help your portfolio,” said Karen Ward, chief EMEA market strategist at JPMorgan AM, which has been adding to its duration bets via Treasuries. The growing risk of a material slowdown in the U.S., compounded by negative headlines around the trade dispute between Beijing and Washington, is contributing to a new spell of investor anxiety. The International Monetary Fund cut its forecast for global growth for this year to 3.5 percent, the weakest level since 2016. China’s outlook in particular is a growing concern for investors, with the nation registering its slowest expansion since 2009 last quarter. “The U.S., Europe, China -- all of those will be experiencing a greater level of slowing, probably a great level of disappointment,” Dalio said Tuesday on a Fox Business Network panel at the World Economic Forum. 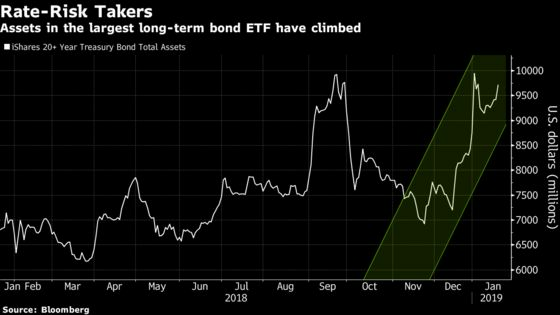 ETF investors have also been piling into longer-dated Treasuries in recent months, with assets in the iShares 20+ year Treasury Bond fund climbing around 40 percent since December. Thirty-year Treasury yields touched the lowest level in nearly a year this month, while their peers in Germany dropped to the lowest in over two years. Of course, the danger is that the global economy stays on an even keel, spurring a sell-off in longer-maturity debt. The IMF left its estimates for the U.S. and China in 2018 unchanged and predicted a slight pickup worldwide next year. And though they think a slowdown will prompt a pullback from tighter policy, delegates to Davos don’t see a global recession in the offing. For JPMorgan AM, which oversees around $1.7 trillion, the main risk is a rapid thaw in trade tensions, which would turn focus back to the inflationary picture in the U.S.
“It’s absolutely not the time to set a position and go to sleep,” said Ward.